This is a beautiful and amazing website. I feel so honored that I met Simon. I’ll never forget my time that I was blessed to share with him. His beautiful, big, blue eyes and sweet disposition will stay with me always. God Bless Simon. Hi my name is Ashley and we have just found out a few weeks ago our daughter Nalia has a rare chromosome disorder called partial trisomy 20q . It has been so hard to get through each day but the more I feel our angel kick and move gives me hope. I would like to hear from anyone who has or is going through this and hear your stories. You can find our story on caringbridge under naliamariepekarek please feel free to comment anything helps. Which type of partial trisomy 20q ? If it is the non leukemia type I actually have it and yes I believe there is hope still for you the way things sounds I am twenty two and a half if it makes you feel better and I am able to do lots of things besides math and science type stuff well I know some math but only up to second or third grade math and collage but I am able to do English and art and singing . If you want to know what symptoms they are learning disability and I don’t know if this caused by pt20q but delusions and depression and I have Adp social anxiety and i have a hardtime witj expressing myself physical appearence just depends mine are a simple helixe in my lower ear broad space between my nose long broad hands and feet and my eyes I am unsure but it might be the Col. or it might be that they may be sideways I did use to walk with a lumbered gait and have or had a hoarse voice. I would love if you could contact me, my friend has a child with the same condition. We have tons of questions that you may help us with. Our unborn baby has been diagnosed with partial trisomy 20q. I would really like to hear from you. As we have a lot of questions which geneticists can’t answer as this is so rare. I read your book and it brought back so many memories and emotions. It is amazing but sad just how similar our journeys were with our beautiful trisomy children. Thank you for sharing your feelings and being honest. I’m saddened I was not able to meet your beautiful Simon, but glad that I have met such amazing people in my journey. Thank you for sharing your story! I am the aunt of a beautiful niece who has Down syndrome. Although there was much more hope for her survival, I have often struggled with the knowledge that others see her as a medical “mistake” something that went wrong in her DNA! No one should have to face this world with that kind of pre-judgement! I believe that in our quest to be great, to be the one on top, we leave behind these precisous gems! Their capabilities will never measure up to the skills we esteem in our society, and so they are often treated as second class citizens! My niece truly is a blessing, just as your son is to you! These children bring life and joy to us in ways we could never imagine! Thank you for your continued efforts of advocacy for them! I am sorry that you had to experience that kind of neglect from your health care professionals, at a time when you needed them the most! God is faithful and your sons life is being honoured through you! Touching the lives of others to this day! Thank you! Thank you for doing this. Our rainbow baby had this as a possibility, and we could only imagine what it’s like to lose a child this way. Thanks for sharing. Thanks for your courage making sure that folks know these are actual people. Keep up the good work! The documentary Labeled is premiering in San Antonio TX this week! This film features Simon’s story, as well as several other children with Trisomy 18, Trisomy 13, 4p- and other diagnoses. The showings will be March 14th and 15th at 1:00 pm at the Christian Worldview Film Festival. If you have friends or family in the area, tell them about this film. Help support Trisomy Awareness Month! If you come to the showing, please stop by our vendor table and introduce yourself. We’d love to meet everyone who comes! I like your site. neat. Labeled is showing in Hollywood, CA THIS SATURDAY (May 10th) @1:45 pm at the Life Fest Film Festival! Most of the awards are based on audience voting, so please share this with your So. Cal friends and help support this important message! If your life is touched by trisomy 18, this is a “must read” book. Reading the story of Sheryl, Scott, and Simon is giving me comfort I need to get through these dark days. My granddaughter is affected by trisomy 18 and, God willing, will be born in a few months. As our family struggles to make sense of this diagnosis and open our hearts to this part of Gods plan, stories like this have given me the strength to continue getting out of bed everyday. Thanks Sheryl, for your inspiring book. Your sweet baby began at conception and God has blessed you with your baby. Tests or no tests He has given you a precious soul. I denied all testing until my last trimester when I did an ultrasound for measurements. They found several concerning anomalies. We listened, prayed and pressed on in faith that babies (all babies) are a blessing. They offered an early c-section to help the baby (which is basically a late term termination of pregnancy the legal way). We declined. We would have missed the greatest blessing of our lives, if we had followed the worldly advice we received. Even members of the body of Christ had the same opinions and views of the world but we wanted the mind of Christ. We were richly rewarded beyond our imaginations. If you are currently expecting an amazing child with the possible gift of an extra chromosome or other such gift, may God show you the shining light of their brilliance and preciousness and may you see it, feel it, and know it. My name is Kristy and almost 5 years ago my husband and I found out our Son had trisomy 18, 20 weeks into my pregnancy. Instead of aborting the pregnancy we spent every memorable moment felling him kick and move. Yes it hurt telling people that yes I was pregnant but he wouldn’t be with us long. But I was not about to abort my baby. At 27 weeks I went into premature labor. 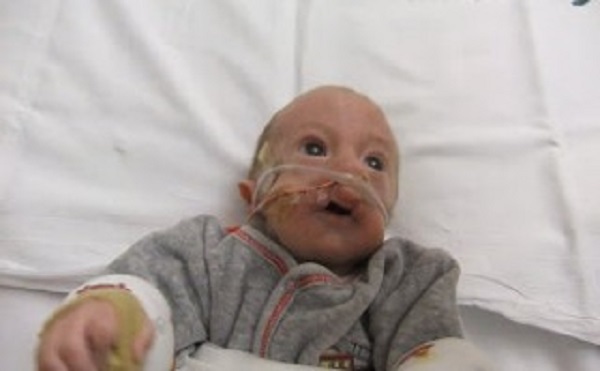 The doctors decided to let him come into this world knowing he would not survive. After being in labor all day he finally came and we got to spend 3 wonderful hours with him before he passed away. I will cherish that little bit of time for the rest of my life. When I seen this in the news it made me think of little Edwin and how much people are not aware of this rare thing that can happen. Thank you for writing this book. I will be purchasing this book to read to Edwin’s two little sisters so that they can better understand what happen to their big brother and why we visit his grave so often. Honored to have had a long conversation with author and mother to Simon (trisomy 18) Sheryl Crosier tonight. She’s got exciting stuff going on in Missouri with Simon ‘ s law on the bill books requiring a parent to provide written consent for limiting care or DNR rather then medical team derived futility decisions for children like ours. NY RTL is looking to make sure infants like Simon and Alexander are not denied prenatal care simply because of a diagnosis. Recall, our situation was that our high risk OB provider scheduled us for a late term termination of pregnancy WITH OUT talking to us about it. Try getting a phone call confirming your termination the next day. The doctor said it needed to get done soon, so he put me on the schedule. We planned on letting Alexander decide what to do, which was go full term and then spend 8 weeks with us happily. We’ve been asked to speak at a lobbying day about Alexander’s journey. I’m looking forward to sharing his story! Great opportunity.